Did Yahoo Changed Its Front Page? 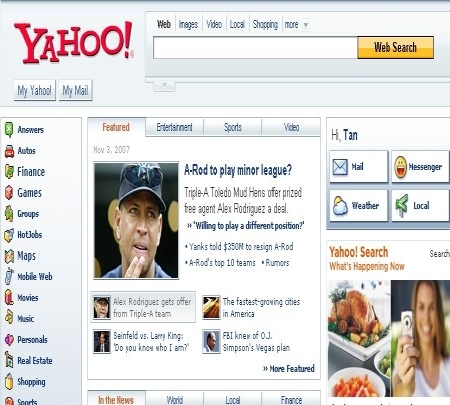 You are here: Home / Blogging / Did Yahoo Changed Its Front Page? 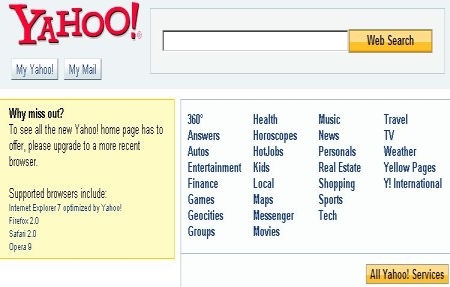 While browsing Yahoo with Firefox today, I noticed that there was really something missing. It looks like Yahoo’s front page has been tuned down to a simpler view, as you can see from the screenshot above. But when I turned on Opera and IE7, I revisited the page and it was back to normal again, as seen below. So what’s happening here? I do like the look of the simpler version of Yahoo’s front page, although it still looks a bit clutter compared to Google’s. But at least standardize a common page for all browsers. Have you had a similar experience or is it just me? I like my Yahoo front page and want to keep it.